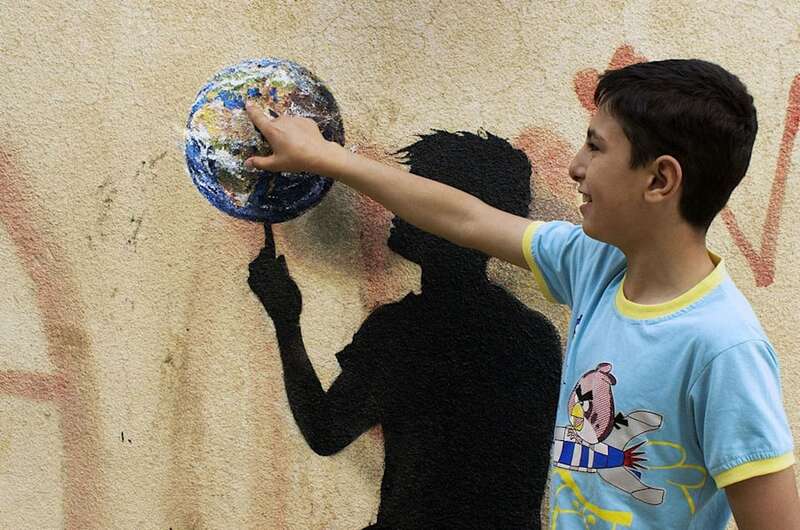 Spanish graffiti artist Pejac visited a couple of Jordan's refugee camps this spring and painted murals he dedicated to children and their mothers in the camps. Jordan is home to 639,000 Syrian refugees -- 80,000 of whom now live in the bustling Zaatari camp. Jordan's King Abdullah said in recent months that the massive influx of refugees has overwhelmed his country and brought it to a "boiling point." In April, Pejac visited the sprawling Azraq camp in east Jordan, which was built in 2014 to alleviate the pressure off of Zaatari. There are currently more than 20,000 refugees in the camp, 56 percent of whom are children, according to the UN Refugee Agency. The artist's intervention in Azraq captures a silhouette of a veiled woman bathing her child. To the left of the images is Pejac's adaptation of a painting by the post-impressionist Spanish painter Joaquín Sorolla, titled Playa de Valencia a la luz de la Mañana (Valencia Beach in the morning light). Pejac said he dedicates this artwork to the mothers in the camp -- three in 10 households in Azraq are headed by women, according to a UNHCR report published in April. "A mother's creativity is something truly admirable -- how they manage to create a special world to protect their child by transforming reality into a better place," he said. The Barcelona-based artist is known for his public space interventions and replicas of classic masterpieces by the likes of Claude Monet and Alberto Giacometti. His artwork -- often carefully designed silhouettes against a wall -- tackles social and environmental issues. Pejac's visit to Azraq follows a visit earlier this year to Al-Hussein, a Palestinian refugee camp in Jordan that dates back to 1948. Pejac spent some time in the popular neighborhood of Jabal Al-Weibdeh during his visit to Amman. In a mural he titled "Rotation," a silhouette of a teenage boy spins a globe like a basketball at his finger tip. "On the one hand I'm talking about Jordan, a country that has a long history of hospitality towards refugees," Pejac said. "On the other hand...a big part of Jordan's population and its future is being determined by, is in the hands of, the kids." Scroll down for more photos of Pejac's artwork in Jordan.